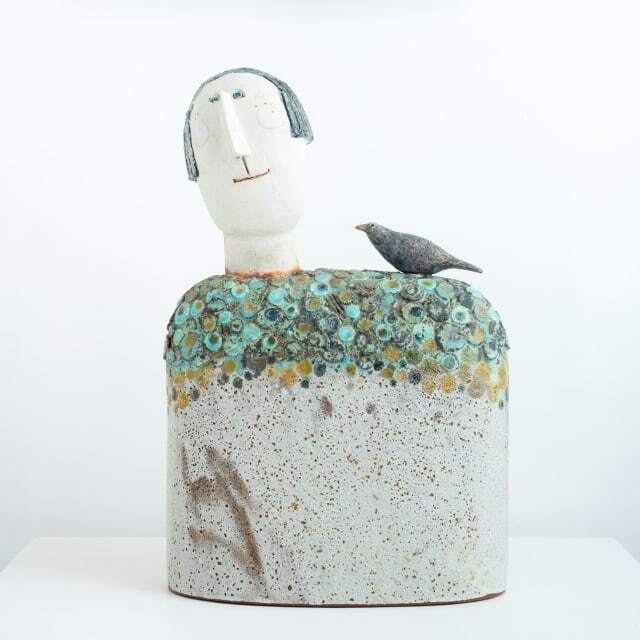 Jane Muir's ceramics are filled with an eccentric humour. They are made with a sensitive human touch that speaks to the viewer, who at once recognises something, or someone in each one. The gentle colours of her glazes allow the rough texture of the clay to shine through, lending a soft, chalky quality to her work. The sculptures themselves are whimsical and border on the absurd or surreal. Birds perch on heads, flowers bloom from shoulders. Other, smaller figures are collected together in boxes, smiling serenely. Her subject matter ranges from large scale figures and animals to tiny birds. Her work offers an uncomplicated and idiosyncratic view of the world. The Little Ladies and Little Men series began life as a way for Jane to test colours out for larger pieces. But, like lots of experiments in the studio, they soon began to become pieces of work in their own right. Jane, by her own admission, is experimental in her approach to colour mixing and this is reflected in the expressive feel of each piece which often includes numerous textured surfaces and glazes. Jane Muir graduated from the Royal College of Art in 1992, and has been a full time ceramicist since then. Her work has been shown throughout Europe, the United States and Japan, as well as throughout the UK. She lives and works from her studio in Peckham, South London.